Pine Furniture, Bespoke Oak Furniture, Bespoke Fitted Kitchens and Freestanding Dressers. Aspects of Pine, Ware, Hertford, Bishops Stortford, Hertfordshire. Personal service by phone or email. Email enquiries@aspectsofpine.co.uk or call 01920 464982 (mobile 07778 627783). Your journey in creating your perfect home starts here. Clemence Richard - A Lithuanian factory specialising in Solid Oak quality furniture. TCH Furniture - A Lithuanian factory producing a number of stunning ranges of Solid Oak and Painted Furniture. 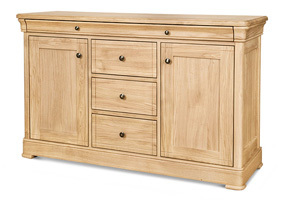 Sylvawood - A UK factory offering a number of ranges of solid wood furniture in Oak, Pine and Painted options. “Aspects” was established in 1993 and is a family run business based in the heart of Hertfordshire's countryside. We believe in offering "Quality Products" together with a very "Personal Service & After Sales Care". Our website, therefore, is not e-commerce and to order you will need to contact us directly by phone or email whereupon we will discuss your requirements to ensure your needs are met, and delivery is arranged to fit in with your hectic lifestyle. Your interest in our company and products is very much appreciated and we hope you enjoy the "Aspects Experience" and become a valued Aspects customer.